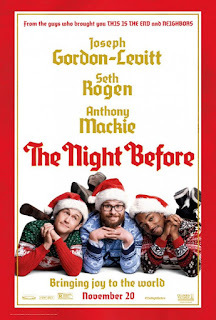 For those of you trying to place this, it's the mid-budget, raunchy, R-rated Christmas comedy you skipped last year. Most years offer at least one such movie, and they have a tendency to blend together. 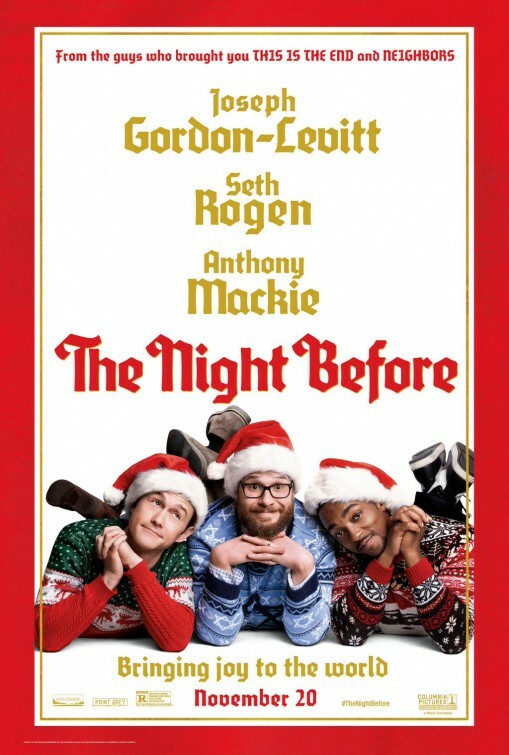 This stars Joseph Gordon-Levitt, Seth Rogen, and Anthony Mackie as Ethan, Isaac, and Chris, three friends who have been spending Christmas Eve together for years, ever since Ethan's parents were killed right before the holidays. Now that they're older, Isaac and Chris feel like they've gotten too old for the traditional pub crawl. Before the movie opens, they've already made it clear that this is going to be the last year, though the other two doubt Ethan, who's accomplished very little in his life, is comfortable with this. To the movie's credit, Ethan is a little more complex than that. While he's not entirely prepared to move on with his life, he's not oblivious to where the others are coming from. Besides, they've got problems of their own: Isaac is terrified by the impending birth of his first child, and Chris is a famous football player whose career is dependent on steroid use. Making matters more complex is "The Nutcracker Ball," a legendary annual party they've spent years searching for but never located... until this year, when Ethan stole three tickets while working as a coat check (an action which - and this is to the movie's credit, mind you - has no consequences). If this premise sounds complex, keep in mind we haven't touched on Isaac being given a box of drugs by his wife, Ethan's recent break-up, and a host of other details sprinkled in. When the movie gets going, it juggles all of this nicely, but it does make the first thirty minutes of setup somewhat trying. I'm going to gloss over most of that to cut to the movie's best two characters. Rebecca, played by Ilana Glazer, shows up claiming to be a fan of Chris's. She seduces him and steals $100 worth of marijuana. Soon after, we discover she views herself as something of a Christmas villain, inspired by everything from the Grinch to the Wet Bandits and - most reverently - Hans Gruber. It's difficult to convey how bizarre and fascinating this character felt. When she successfully outruns Chris, you don't even doubt it. He's just a professional athlete; she's superhuman. We never get that verified, incidentally. She delivers some needed words of wisdom to Chris and disappears from the plot. The movie's less cagey about its other mystic, Mr. Green, played by Michael Shannon. He's a drug dealer the three protagonists knew since high school. They call on his services to get weed for the party (one of Chris's teammates, also going, asks him to bring some). It's fairly obvious from the get-go that there's more going on with him than meets the eye. His marijuana comes in three strains: present, future, and past, and the latter two have the expected result. He's also the one running The Nutcracker Ball, a fact pretty clearly broadcast to the audience early on (though the characters miss it). Towards the end of the movie, after the main characters take off in his car, he tells the audience he finally feels like he deserves his wings, which unfold from his back as he flies into the sky. Then, he makes another appearance in a somewhat random epilogue in Santa's workshop where it's revealed he's Santa's son. These two moments really don't fit together - I'd have preferred if Rebecca had gotten one of these scenes (either, to be honest). I loved both characters, but it felt like he was slightly overused, while she was dropped a bit too soon. Making her the daughter of Santa would have helped (plus, it would have given us a great explanation for her irritation with the holidays). There was a lot more to this movie - I liked that the three characters were each given one (and only one) interaction with Mr. Green, where they each confronted the element that was haunting them: Chris needed to come to terms with his present, Isaac with his fear of the future, and Ethan had to move beyond his past. It was a clever spin on A Christmas Carol, albeit one that could have benefited from more depth. The characters were funny, but none of them were believable. Isaac's issues were magnified to the point of absurdity, while Chris's celebrity status and steroid use were forced and underwritten. Ethan came closest to feeling like a rounded character, but his issues never came off as especially complicated. His biggest mistake was losing his girlfriend because he refused to meet her parents. By the end of the movie, he'd grown enough to meet them and therefore win her back. Drama, this is not. But, in fairness, this isn't supposed to be a drama: it's a comedy. And, it's fairly good at that - the jokes are generally funny, the leads do good work, and it offers quite a few twists. Plus, you get the requisite rapid-fire of cameos and bit parts from famous comedians, actors, and more, including a pretty fantastic sequence where Miley Cyrus plays an exaggerated version of herself. In some sub-genres, that would be enough. The thing is, there are a lot of Christmas comedies out there. And while this easily lands in the seventy-fifth percentile (hell, it might be in the ninetieth), that's not really sufficient. It's missing a core point, a justification for existing. It could be a meaningful theme, relatable characters, or a fulfilling allegory - anything you could point to and plausibly claim it does better than what's already out there. But as good as Mr. Green and Rebecca are, they don't make the movie resonate. There's a lot going on in this thing, and there were plenty of cool ideas. I wish they'd spent a little more time developing one or two of them into something that packed some sort of emotional punch. Make a short list of the great Christmas comedies, and you'll find they pull that off. This might be as funny as Bad Santa (well, it's at least in the same league), but it's nowhere near as adept at storytelling. All that said, if you're a fan of comedy, this is great for a laugh. Just don't expect it to become one of your favorites.